Reginox has launched a new range of waste disposal units, which include an antibacterial coating for added hygiene. 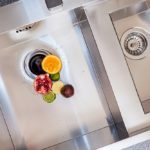 Designed to unobtrusively grind and flush away food waste, the four models in the new waste disposal collection are not only quieter, but also feature a more powerful motor, than the company’s previous WDU range. They also have an antibacterial coating for added hygiene, a removable splash guard for easy cleaning and a quick fit mechanism for fast and simple installation. The new collection features four progressively powerful models – the RD50, RD60, RD70 and RD100.